VIDEO: Dave Zabriskie goes solo at the Boulder Theater Thank you VeloNews for providing this video! In the first row of the video are DZ's teammates enjoying the entertainment, L-R: David Millar, Peter Stetina, Tyler Farrar, Tom Danielson, Heinrich Haussler, Johan Vansummeren, Alex Howes, Christian Vande Velde. And a virtual who's who of cycling behind them. Last night in Boulder, Colorado, Dave Zabriskie, known for his previous singing debut at the Giro d'Italia and various team bus appearances, again wowed the crowd with his original lyric rendition of Rolling on the River. What amazed me most is the man who struggles with interview questions, came front and center at the first request to sing. And although the audience clapped after the first and second verse, Dave, with typical focus, continued right through to the third verse. Most of us would need to be coaxed into performing to a packed house of fans, but apparently stage performance is Dave Zabriskie's real gift, that US National Championship Time Trial pales in comparison. It was a blast to be there in the audience for this surprise singing performance last night. We were all laughing! 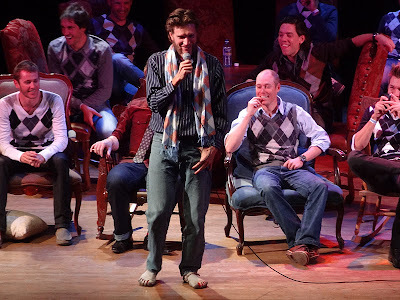 Dave Zabriskie entertained the fans and his teammates at the Boulder Theater last night. Notice Heinrich Haussler on the right trying to captures the moment as his teammates laugh and relax. Dave Zabriskie sings "Rolling on the Garmin"
After the party, someone offered to get a picture of me with Dave, so I turned to Dave and said, "I don't usually do this, and I know you don't, but for you I'll do it," he chuckled and now I have a photo of DZ and me. 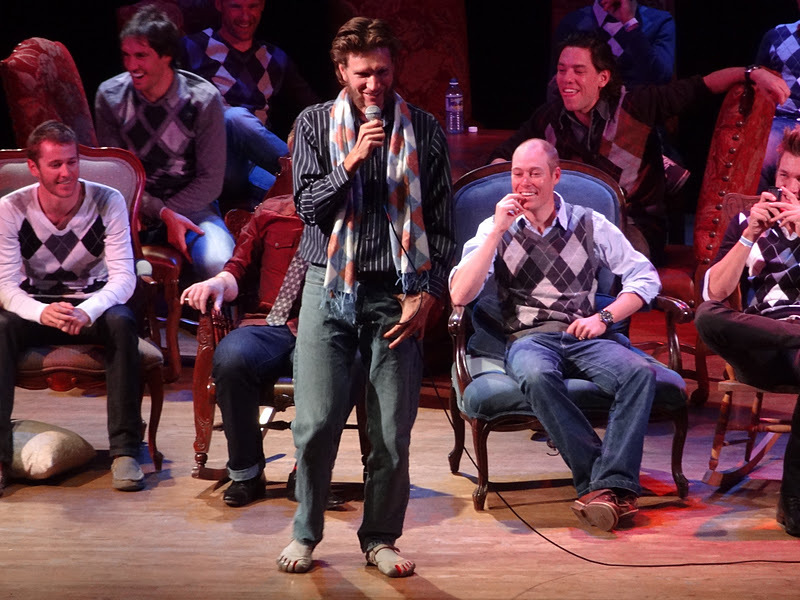 Later, on our way out of the Boulder Theater, I asked Dave, "how do those shoes do in snow?" He paused and chuckled again. What fun to catch Dave Zabriskie off-guard.